Looking for deals in Bologna? Zanhotel Regina is located between Bologna Central Station and Piazza Maggiore, close to La Montagnola Park. All of Bologna's attractions are within walking distance. Great location, a walk to the station also very close to shops, churches, restaurants etc. Comfortable bed and clean. Breakfast was good which were kept topped up by the attentive staff. Had a bar, the barman on the second night made a great G&T! Good hotel would recommend. Located in the historical center of Bologna, The Art Hotel Commercianti offers free breakfast, free WiFi throughout. It is next to the San Petronio Basilica and the Fountain of Neptune. It was two rooms, one with a pull out couch which was out when we arrived. We decided not to use it. They provided enough soap and everything for 4 people, wonderful slippers, robes, bathtub was really nice. Great location, and after finding it, left car in garage. Building had character and was luxurious. Wonderful happy hour with snacks, prices reasonable for everything. Breakfast was abundant with so many choices of everything. Pastries delicious, staff really attentive, coffee delicious. Would most DEFINITELY stay there again. Loved Bologna! The people at reception were so nice and courteous and answered all questions, made recommendations to lovely restaurants, just everything was great. Not one complaint at all. Dating back to 1375, the Al Cappello Rosso is one of Bologna’s oldest boutique hotels. You can‘t beat the location as it is right around the corner from piazza maggiore. Loved the art in the building and the room, which made the place really unique. The rooms were cozy but did the job for our stay and the bathrooms had all the amenities we needed. Bologna's Suite Elite is a design 4-star hotel a 15-minute walk from Piazza Maggiore and an 8 minute-drive from Guglielmo Marconi Airport. Rooms have free Wi-Fi. Great value for the price. Huge room and breakfast. Hotel Cosmopolitan Bologna is close to Bologna's exhibition center and the exit number 9 of the Tangenziale motorway. It offers free parking and a free scheduled shuttle to the trade fair. Location was great! They offered shuttle bus to the center for 5euro per person round trip!! Only a 5-minute drive from Bologna Airport, Hotel Amadeus has large rooms with free Wi-Fi, air conditioning, and an LCD satellite TV. Parking is free. First impression was WOW! The room was spotless and the staff members were super kind! Housed in a 19th-century building, Albergo delle Drapperie offers accommodations in the heart of Bologna. This is a totally hidden gem. It is located just steps from Piazza Maggoire but is extremely quiet. Hotel Liberty 1904 is in the San Vitale area of Bologna, 0.6 mi from the historic center and a few steps from Sant'Orsola Hospital. The air-conditioned rooms have a flat-screen TV. It was a great hotel, right next to a bus stop that brought you directly into the city center. Best Western Plus Tower Hotel Bologna features contemporary-style rooms with free WiFi and a free indoor garage. It is a 5-minute drive from the A14 motorway and 2.5 mi from Bologna city center. The room was lovely, modern, clean, comfortable. Very nice, huge bed. Great breakfast. Housed in a restored antique monastery built in the 16th century, Hotel Pedrini is located along Bologna's Strada Maggiore, 0.7 mi from Piazza Maggiore. Breakfast was pretty nice. Service was excellent. Room was clean and nice balcony with cute view. The Atlantic is a minimalist hotel just a 10-minute walk from both Bologna Centrale Train Station and Piazza Maggiore, the main square. All rooms have free internet and air conditioning. Great place, comfort, location and attitude. Hotel Maggiore is set at the foot of San Luca Hill, just 1.9 miles from Guglielmo Marconi Airport. Take one of the free bikes for a ride around Bologna. This hotel was great, easy check in and check out. 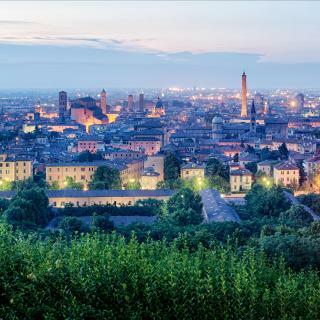 Hotel Aemilia is 15 minutes on foot from Bologna's city center and famous towers. It offers modern rooms with free Wi-Fi, air conditioning, and high-definition LCD TV with international channels. We loved everything. The staff is professional and helpful. The food was simply delicious! Offering free WiFi, Savhotel is 1640 feet from the Fiera di Bologna exhibition center, and just 5.6 mi from Bologna Airport. Excellent!!! Everything is amazing!!!! The Art Hotel Novecento has elegant rooms with free Wi-Fi, a generous breakfast, and a great location in the center of Bologna. 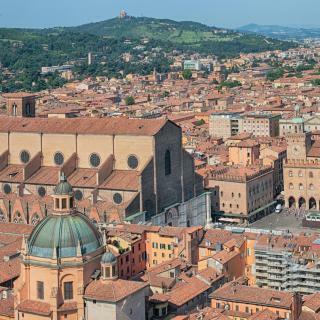 The Towers of Bologna are a 5-minute walk away. Really nice hotel in a very central location. Albergo Garisenda is set in the heart of the city, directly opposite the Towers of Bologna. It offers functional rooms with TV, free WiFi, and wood or tiled floors. The hotel is situated in the center of the center. Hotel Metropolitan is set just 5 minutes' walk from Bologna's main square and 164 feet from Via Indipendenza, which is the main shopping street in the center. Perfect Location. Very nicely decorated. Porta San Mamolo has its own garden where you can enjoy an excellent free breakfast. It is in a quiet location, just a 10-minute walk from Bologna's main square. Rooms are modern at Porta San Mamolo. The location was excellent 15 minutes from centre . The staff could not be more helpful . 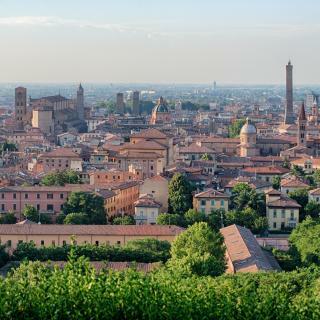 Which neighborhood is the best one to stay at in Bologna? Bologna Fiere District, Bologna City Center, and Bologna Train Station are popular with other travelers visiting Bologna. Which hotels in Bologna are good for couples? These hotels in Bologna are highly rated by couples: Grand Hotel Majestic gia' Baglioni, Le camere di Porta San Felice, and Art Hotel Orologio. What are the best hotels in Bologna near Via Indipendenza? Some of the best hotels in Bologna near Via Indipendenza include My Home in Bologna - La Rossa, MANDRIA APARTMENTS 1 2 and L'8 Boutique Design Apartments. What are the best hotels in Bologna near Guglielmo Marconi Airport? Travelers who stayed in Bologna near Guglielmo Marconi Airport (BLQ) have said good things about FlyOn Hotel & Conference Center, Hotel EMI, and Hotel Brianza. Which hotels are the best ones to stay at in Bologna? Savoia Hotel Regency, Art Hotel Commercianti, and Zanhotel Regina are some of the popular hotels in Bologna. Which hotels in Bologna have nice views? Art Hotel Orologio, Savoia Hotel Regency, and Aemilia Hotel Bologna got great room view-related reviews from travelers in Bologna. How much is a hotel in Bologna for tonight? On average, it costs $123 per night to book a 3-star hotel in Bologna for tonight. You'll pay around $225 if you choose to stay in a 4-star hotel tonight, while a 5-star hotel in Bologna will cost around $382, on average (based on Booking.com prices). How much does it cost to stay in a hotel in Bologna? On average, 3-star hotels in Bologna cost $84 per night, and 4-star hotels in Bologna are $108 per night. If you're looking for something really special, a 5-star hotel in Bologna can be found for $473 per night, on average (based on Booking.com prices). Which hotels in Bologna offer an especially good breakfast? For hotels in Bologna that serve highly-rated breakfasts, try Grand Hotel Majestic gia' Baglioni, Art Hotel Commercianti, and Savhotel. How much is a hotel in Bologna for this weekend? The average price per night for a 3-star hotel in Bologna this weekend is $227 or, for a 4-star hotel, $349. Looking for something even fancier? 5-star hotels in Bologna for this weekend cost around $650 per night, on average (based on Booking.com prices). Which hotels in Bologna are good for families? Many families visiting Bologna loved staying at Le camere di Porta San Felice, Hotel Corona d'Oro, and Grand Hotel Majestic gia' Baglioni. 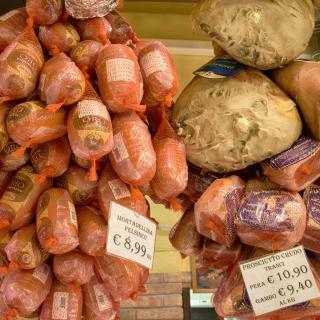 World-class cuisine is what Bologna does best. Nowhere in Italy, a country with considerable culinary heritage, is the food considered to be better than in this medieval gem. Bolognese sauce of course originated here, but to try the real thing look for "ragú" on the menu. Cold meats and cheeses are also exquisite. Make sure you save plenty of time for eating – the Bolognese like to savor their food, so a meal can last for hours. Many of the best eateries and homemade ice cream shops are found behind the mile upon mile of porticoed streets, now UNESCO World Heritage sites. The complex of medieval churches and buildings in cobbled Piazza Santo Stefano is a tranquil spot to explore. Climb one of the Two Towers nearby (not the one leaning at a startling angle) for spectacular views of this red-roof city. The focal point of Bologna is huge Piazza Maggiore, whose Santo Petronio church has an unimpressive, half-finished façade that doesn’t prepare you for its sheer scale inside. Fanning out from this square, the buildings of Europe’s oldest university, founded in 1088, are home to the city’s best museums. Bologna accommodations at Booking.com range from small B&Bs to luxury hotels, all easily accessible from Bologna Airport just outside the city. Cooking Class with Cook Italy is a one on one personal experience- highly recommend if groups are not your style. Shopping in Bologna is the the coolest among the major cities. All the Italians know this but have kep it a secret. Only one 5 Star Hotel in City Centre but location is killer. The world of shopping is right outside hotels located in City Centre. The owner of the Little Shop or Little Cottage is a weath if information especially for lodging. Clean hotel under renovations. The standard room was very weak. We gladly upgrade for 15e. But the web-site should have clearly indicated the renovated room. The thermostat did not work properly. Too hot. Bologna is much more than we expected. Easy to walk around with a lot of interesting older buildings, restaurants, shops etc. We are not in the best physical condition but did not have a problem. Stayed at Hotel Internazionale on Via indipendenza and had one of the best breakfasts (included) that we have had in a hotel. They recommended local restaurants and they were excellent. Nice city to people watch - a lot of younger people. Great city with plenty of history and culture; tourist-friendly yet still unspoiled by over-tourism. The locals are relatively friendly people although very little english is spoken. I booked 3 nights in Bologna (first), followed by 3 nights in Milano. I'm typing this from my hotel room in Milano, and to be honest I'm already missing Bologna. 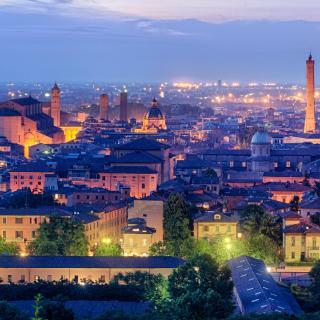 Bologna can offer everything you would hope to find in a modern yet historical city in North Italy. My favorite part about Bologna is that although the city has embraced modernity, it still has that old-town charm and laid-back vibe, especially when comparing it to Milano. Bologna: a place to take it easy and stay dry. We enjoyed walking/hiking the r/t of 5 miles from our hotel to the sanctuary of the Madonna di San Luca--the entire route is almost entirely under porticos (including the longest one in the world), which was great since it drizzled a lot that day. No need for umbrellas. The two towers are nice to see day and night and the stairs up the open one felt solid. (From other reviews we expected wobbly ones.) The outdoor markets were fun to visit. So many sites are close together and easy to see in a short time. Would've liked to spend more time in Bologna just to relax. Great value and lots of things to do. The paleontology museum at the University is open to the public and has no entrance charge. It has a very Indiana Jones feel to it and a very cool dinosaur fossil in the grand room. Visit the Parmesan Store and buy some product. Take a day-trip to the Ferrari Museum in Modena. 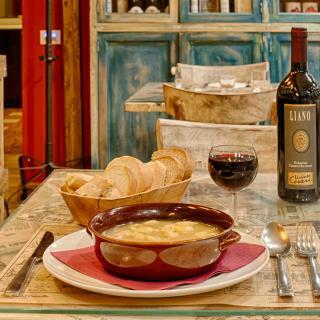 The location is perfect- right at the heart of Bologna. Very easy to locate since cab drivers know the hotel and signs to the hotel are around the city. There are complimentary pastries, fruits, juice, coffee and tea every morning. We booked a room for 5 persons with private bathroom and we can still use the sharing bathrooms outside our room. Our room is spacious- with dining table. Even the bathrooms are huge! Old basic hotel, but homey and clean. The staffs speak English. They can book a taxi for the guests. Love at first sight, amazing place! I couldn’t believe my eyes - everything was classy- the room, the balcony, the terrace on the roof with Bologna views, and the luxury toiletries from Davines, we didn’t want to leave the place. The personal super friendly and patient, helped us fix parking problems. The breakfast was also delightful- wide choice of everything, including cheese ham prosciutto and different fruits and vegetables. So far our best stay, would definitely come again to this hotel. Really excellent hotel, very friendly and helpful staff plus great breakfast buffet. Rooms were very nice, comfortable, quiet at night. The hotel is spotless clean. A little outside city centre but easy 30 mins walk that is mostly along the main street. There is also a bus stop near hotel but walking to centre gives great sense of city. Bologna is lovely city and great location for trains to Florence, Verona etc. Also the main station, Bologna Centrale is just 15 min walk from hotel. Boutique describes it perfectly. Cannot fault it for location, facilities or friendliness. With comfortable walking shoes, a stroll to the Piazza Maggio is a doddle. The classic Bologna porticos lead the way. Pity about all the graffiti though. Not the hotel's fault. Busses aplenty to the Stazione Central. Restaurants aplenty en route to the centre of Bologna. I am pleased I found this little gem on the net. For the price, a bargain. Oh and close to a hospital. Location was perfect! 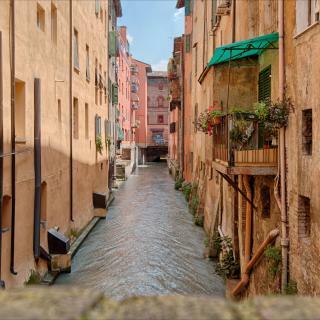 Just in the centre of Bologna, very short walk from via Indipendenza and piazza Maggiore, 5 minutes walk from the airport bus drop off stop and 10 minutes walk from the train station. Facilities very good including lift to the apartment floor, great if you have luggage. Host was very friendly and helpful, he gave us good instructions to good cheap restaurants. Room and bathroom were very clean. Great spot to be near airport without an impersonal typical airport hotel feel. It's got a boutique ambiance and stayed open at the desk past midnight for me and 3 other late guests. Not sure they would have stayed open much later if it has been just me. I emailed and Alessandro agreed to stay til 12:30. Nicole was the agent and delightful. Nice breakfast with great croissants and hard boiled egg to add protein. I loved the proximity to Bologna Centrale Station. It was just the right distance from the hustle and bustle of downtown. Suoermarkets were located on my walk home from visiting the sights. The apartment was very clean and well maintained. The bed was very comfortable as well. The bathroom and shower were nice and spacious. I would definitely stay here again! We were greeted by the hosts who were extremely friendly. The location is a huge positive for this place as it is a 10 min walk from Bologna Centrale station and 10 mins walk to the main square. The apartment itself was beautiful, and had all basic necessities to call it home for a few days. We enjoyed our stay. Nice small boutique hotel located in a nice quiet street just off Indepenienza and a very short stroll to central Bologna. About €10 in a cab from the station or you could walk if it's not as hot as it was when we were there. Very nice room with a good comfy bed and working aircon with a stylish bathroom. Ivo was super helpful, personal, and informative. When we walked into the BnB we thought it was a 5 Star luxury hotel. Clean, decorated, and quiet, it was the perfect place to stay in Bologna. And the train station is a quick walk away. I highly recommend this to the highly priced hotels in the Bologna. Very nice and clean, quite spacious (comparing to other hotels in Italy I stayed in). Fantastic staff - very cheerful and helpful! Quiet area, good breakfast and nothing to complain about. Location is a bit far from historical center (~3km), but there are regular buses and hotel offered rental bikes. The hotel is located right across Bologna Céntrale train station. It is very convenient if travel by train to Venice or Milan like we did.The hotel is modern and clean. The rooms are very spacious. Very close to the center of Bologna, shops and restaurants. The rooms are small but comfortable. Hotel is relatively close to centre and close to train station and airport. Also hotel is located in one of the major streets of Bologna which is a plus. Really good hotel to stay at when your in Bologna. Rooms were very neat and clean. Just 4-6 minutes walk to the bologna central railway station Recommend it! The rooms were clean, the location very central and the staff were welcoming and informative. The hotel itself is classic Italian style and old style luxury. It was right in the centre of Bologna Over all it was good to stay close to the food market and eatitaly! Very elegant hotel at heart of Bologna within a historical building. You'll pay principally for that. Perfect Location. Very nicely decorated. The family room was perfect in size and the bathroom was fantastic. Very good service very friendly staff.